Another awesome thing about this recipe, is you can freeze them instead of baking for a dinner at a later date. I love freezer make ahead meals! This recipe is a family favorite! They are so easy to make and taste amazing! Combine cream cheese, salsa, lime juice, ground cumin, chili powder, onion powder and garlic in a large bowl and stir until well combined. Once combined, stir in the cilantro and green onions. Add the chicken and cheese; mix thoroughly. Spoon 2-3 Tablespoons of the chicken mixture onto the lower third of a tortilla. Roll the tortilla as tightly as you can and place on a greased baking sheet, seam side down. Repeat with remaining tortillas and make sure to leave space between each taquito. Spray the tops lightly with cooking spray. Bake for 15 – 20 minutes or until crisp and golden in color. **To freeze: Before baking, flash freeze the taquitos in a single layer on a baking sheet then place in a labeled freezer bag and store up to 3 months. To bake a frozen taquito (no need to thaw first): Preheat oven to 425˚F and bake for 20 minutes. (Flash Freeze means freezing the taquitos in a single layer for 15-20 minutes (until hardened) so that when you add them to the freezer bag, they will not all stick together). Oh my!! I need some taquitos right now.. they looks delicious..
Those look SO yummy and I love a good make one for now and one for later meal! Thanks! This is my new favorite recipe! They're PERFECT for leftover chicken! I made a batch for after baby is born, and I still make them a lot for lunches because they're so quick, easy, and delicious! These sound wonderful! What a great way to use leftover chicken or to quickly poach a few pieces to shred. We will be having these for dinner this week! Thanks. Made these!! They were a hit, even my college boys ate them up!!! That's always the test! These look amazing! Yum, super delicious - great flavors! What a great idea for a fast yummy dinner...thanks for the tip on the flash freezing! These sound heavenly! 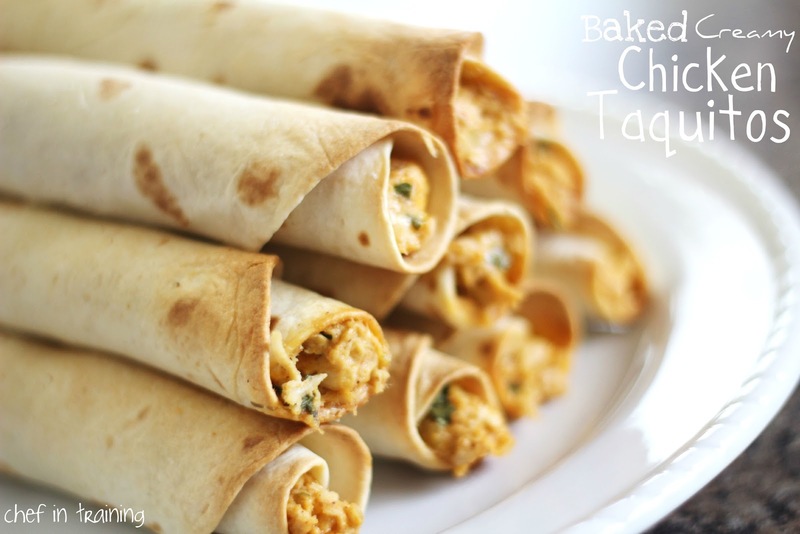 I am also a taquito fanatic and will most definitely be trying these out! I love taquitos! I am so excited about the idea of homeade ones! These sound healthy and yummy! Great post! Keep the quick and easy dinner ideas coming. Found you via Pinterest and am so excited about this recipe. I love love taquitos and the fact that this is home made and freezeable just tops it off. You have a new faithful follower now! my husband loves taquitos. i am definitely making these this week! it'll be my new recipe of the week - part of my new year's resolution. Quick, Easy, yummy - that is what I am all about at dinner time! Thanks. Pinned and bookmarked for future use. These look delicious, I'm making them for diner tomorrow with some homemade refried beans (in the freezer) and cilantro lime rice. It will be one yummy meal. Thanks. I've done something similar to this before except used a buffalo chicken mixture instead of a traditional salsa & chicken mixture. So easy and really yummy. Great idea with the green salsa and flour tortillas; this looks like my lunch! These sound wonderful! I want to try them with corn tortillas to keep them gluten free. thanks for sharing! Do you recommend a brand of green salsa? two words..IN LOVE.These are so good I wish I could eat them everyday.seriously. Hi. I just found this recipe on pinterest and can't wait to try it! I love your blog and you have such a nice family. Our kids are all grown, so I enjoy seeing pics of little ones again. Thanks for sharing! God bless! These are very good, I made exactly as stated. Next time I will reduce the spices as it was pretty overpowering for my taste buds. I've made these and they are delicious!! These look so yummy! I wonder if reduced fat cream cheese would work? I'll definitely have to give these a try. Thanks for sharing! Just curious how to cook the frozen ones. Thaw first and cook same way, or cook frozen?? Oh and BTW, these are in the oven as I type and they look/smell/taste (I had to taste the mixture) delicious! How do you stop the corn tortillas fro splitting when you roll them? I just had major issues! I had the very same problem with the corn tortillas...they cracked and split open - some on the cookie sheet while prepping and all but one while in the oven baking. Made these, relatively easy and I must have gone heavier on the cilantro and chicken a bit because I ended up with 18 Will definitely make again! To the previous poster...if you heat the corn tortillas in the microwave for 30 seconds (3-5 at a time) it will prevent tearing. I did this and they still cracked....I think I'm cursed! It seems like as they sat during prep that more of them cracked. Should I have moistened the towel I placed them in during the microwaving? Wow! I just made these for dinner and they are amazing! They whip up fast, cook quickly, and they taste great. My kids are gobbling them up. I love that you can make the filling ahead and freeze them too. Thanks for sharing these! LOVE Taquitos and more important love the fact that we can freeze these. Thank you for sharing! I just made these tonight. They were soooo good! I didn't use the chili powder as I didn't want them too spicy. I also bought a fresh rotisserie chicken for the pulled chicken to save some time. Great recipe! Thanks for sharing! Yummy! I've seen a bunch of people pinning this, and it looks so good!!! I did that :-(. We even rubbed the tortillas with oil while they were warm. Maybe I should use a different brand next time. Thanks, though. Is it possible to make this with beef instead? WOW!! These taquitos were AMAZING! I made these last night - I am not in love with cooking, and I really hate to stand in the kitchen for hours, chopping and prepping, etc. But the filling for these taquitos was super easy to make and then they only took like 15 minutes to cook - it was like the best recipe ever! :) Then, to top it off, they were so flavorful and delicious! Thanks for posting!! We'll definitely make these again and again. Found this on Pinterest and made them last week...they were so good! Thanks for sharing the recipe! omg I made these for dinner tonight!!!! the were to die for! I forgot to buy green salsa but I had a can of green enchilada sauce so I use a little bit of that and they still turned out great! Thanks for the recipe!!! Just made for a bible study. Turned out awesome!!!! I bought tortillas that were a little too big, so they ended up being extremely filling. These are delicious!!!! I bought a Costco chicken already cooked and used a green tomatillo salsa from there. Excellent! Will be making these over and over again. Thanks for sharing the recipe. These are the greatest taquito's I've ever had in my life. I've never made them before and they turned out excellent. I added black beans and it was perfect. I'm going to make these all the time now. It's a keeper! I found this recipe on pinterest. It is so yummy. I have made them 3x now. Once we ate right away, once I froze it and we ate later in the week. The third time I made them was for family that had a baby at 27 weeks. I made froze them to keep around to eat between hospital visits. Thank you for the yummy recipe. Just made these a couple days ago; and they were a huge hit! There is only my husband and I so we had leftovers and my husband who never eats leftovers, ate them the next day and was happy to do so. This is def going to be a staple in my recipe box! I made these tonight and they were a BIG hit! Although I have to admit a dumb mistake I made - in your ingredient list, it says "1 cup shredded Mexican flavored cheesesmall flour or corn tortillas" (I think you just missed an enter in the middle) - but I thought it actually was talking about some special Mexican flour called "cheesesmall flour" that you could use to make tortillas. It wasn't until I was reading the directions and it said to add cheese that I figured out what was going on. Haha!! I made these for a birthday party & they were a big hit! Even when we returned home from an evening of dancing & frosty beverages, they were great just be reheating for a few seconds in the microwave! I've already been asked to share the recipe! I made these last night. This recipe does not disappoint and they are delicious served with guacamole! I quickly poached and shredded some chicken tenderloins for this recipe. I also used 1/3 less fat cream cheese and reduced fat shredded cheese. I used Mission carb balance tortillas. The carb balance version didn't come in the smaller package of 12 soft taco tortillas., so I had 8 fajita-sized tortillas. I stuffed all of them pretty generously and I still have filling leftover. I need to get some more tortillas so that I can enjoy the rest of this. Two taquitos was plenty for me with chips, salsa, and guac. My fiance' ate four. These were delicious. A bit of work, but nothing at all difficult. Great recipe, thanks! My daughter gave me this recipe and it's been such a hit with my bridge club and my girls' weekend at the beach. I freeze them and take them to my grand daughter in college and she LOVES having them in the freezer to pull out as a meal or snack. I serve them with guacamole and sore cream ...YUM!!!! I want to make these for dinner tonight. But I'm just curious...how do you get the seams to stay together while they bake? I'll be using corn tortillas...do those work without falling apart? :) Thanks! I am so glad I found this recipe, it is fantastic! My boyfriend loves taquitos from the frozen food section, but I don't like to buy prepackaged meals so I tried out this recipe. He said it was 100x better than the frozen stuff. I will definitely be making these again! I didn't have any green salsa on hand so I just used regular and it tasted great. I just made your taquitos, though mine look more like enormous burritos! but so delicious! Thank you for yet another amazing recipe!!! Given the amount of exclamation points used with every sentence in your description, I think I have to try making these. my second time making this recipe and its been awhile.. The hubby can't wait for supper tonight! Happened to stumble upon this recipe and just made it for my family--was very good! My family loved them -- even my 6 year old twin girls. thanks!! In the directions it says to add chicken and cheese as the last steps for the filling. But the only cheese I see in the recipe is the cream cheese which was already put in the bowl. So...should I be adding some sort of shredded cheese to this as well? If so, how much? Try it with shredded rotisserie chicken, you won"t ever go back to anything else! Isn't this the dairy free menu? Mine come out the size of burritos but oh my gosh are they fabulous that way! Thanks for the plate full of delicious-ness! This is one of our favorite recipes! SO GOOD! These were delicious! Thank you so much for the recipe. We also used some leftover grilled steak and some jalapeno pepper cheese for a little spice and they were amazing. This was amazing! I only had regular salsa and lime juice and they still were awesome. Will definitely make this again! These were so good! We made a double batch for company and they were devoured. I used corn tortillas since we were eating them right away but would use flour tortillas if I was going to freeze a batch because the corn crack when you roll them (yes, I warmed them up). Definitely a favorite. These are one of my favorite things to make. I could eat the filling on its own. Very yummy! Thanks for the recipe. I made these today for my Cinco de Mayo party and they were a huge, huge hit. Thanks for the recipe! I made these and they are amazing!!! These were amazing. I made these last night and my sweetheart loved them. He is a fan of tacos so any type of tacos I try to make. These were great! Thanks for the added recipe. Loved the flavors!!! My family totally gobbled these up. Thank you so much for the recipe. I did want to bring up one point though: we decided to use corn tortillas (since you give an option of using either corn or flour), but that was a big mistake. I couldn't roll corn tortillas tightly without cracking them. I tried rolling them cold, I tried rolling them warmed up (as you suggest)--and the result was not pretty (it was actually worse when they were warmed up). So while the final result and the flavors were amazing, they looked far from pretty. Thankfully, the family didn't care--but I would definitely stick with flour tortillas next time. loved these. they are so flavorful. served them with sour cream, fresh salsa and guacamole. so delicious. thanks for sharing this. cant wait to make them again! These are delicious! My boys LOVE them, which is not their usual approach to food. Like with flour tortillas. Have frozen the extras and they are still good when left in fridge to defrost before baking. Yummy! Could you bake these first , then freeze and just heat in the microwave?! You need to give credit to Best Bites - since it looks like you copied (almost) word for word on here. Please give credit where credit due! My husband does not like anything spicy. Is there anything I can leave out so it isn't spicy, but yet still tastes good? Hi there! How would you cook the chicken? Can anyone tell me how many taquitos this recipe makes? I am wondering if I need to double it for the number of people I am feeding. You have 12 ingredients. 5 require processing. 5 others are ones that I normally don't have in the house. This is NOT a 'so easy to make' recipe. It's a medium recipe. Something I would consider doing ONLY if I was doing a huge batch for the freezer.